Reference number for this case: 17-July-54-Istres. Thank you for including this reference number in any correspondence with me regarding this case. On Saturday, July 17th, on the road to Istres, a textile merchant and his wife were cruising along in their little van at some 100 km an hour. All at once, the driver noticed, at a slight distance from the windscreen, a strange bluish light. Then everything happened in a flash! Did the bluish light reach the windscreen, or did it emanate from it, in immediately preceding the incident proper? Impossible to say. The fact is, that after the appearance of this mysterious light the windscreen flew into splinters. The driver braked hard and stopped. At the same time as the windscreen splintered, a strange whitish mist, an impalpable but sharply defined cloud, formed in the van. The driver's wife felt an inexplicable heat envelope her bust. A kind of uniform pressure pressed her nylon blouse to her skin; we must emphasize that neither the wind nor the surrounding warm air had any part in this phenomenon. Imagine this business lady's astonishment on discovering, immediately after experiencing this strange sensation that her white nylon blouse had become straw yellow! "On Saturday, July 17, on the road to Istres, a textile merchant and his wife were cruising along in their littie van at some 100 k.m. an hour. All at once the driver noticed at a slight distance from the windshield, a strange bluish light. Theen everything happened in a flash! Did the bluish lighit reach the windshield, or did it emanate from it, immediately preceding the invident proper? Impossible to say. The fact is, that after the appearance of this mysterious light the windshield flew into splinters. The driver braked hard and stopped. At the same time as the windshield spintered, a strange whitish mist, an impalable but sharply defined cloud, formed in the van. The driver's wife felt an inexplicable heat envelope her bust. A kind of uniform pressure pressed her nylon blouse to her skin; we must emphasize that neither the wind nor the surrounding warm air had any part in this phenomenon. 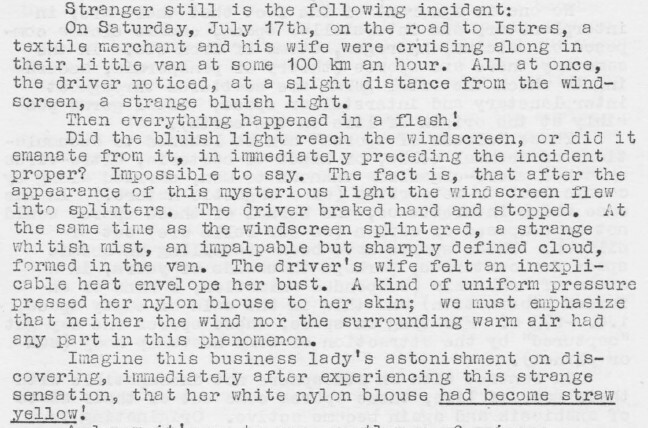 Imagine this business lady's astonishment on discovering, immediately after experiencing this strange sensation, that her white nylon blouse had become straw yellow." [---] Article by Jimmy gieu, in the regional newspaper Le Méridional, France, 1954. [jg2] "From Windscreen Disease to Flying Saucers", article condensed from Jimmy Gieu's Le Méridional article, in the flying saucers magazine Uranus, English version of Ouranos, Eric Biddle editor, U-K., Vol. 1, #2, page 27, October 1954. [cf1] "Monitoring and Scanning UFOs", article by C.W. Fitch, in the ufology magazine APRO Bulletin, USA, page 5, July 1963. 1.0 Patrick Gross December 6, 2016 First published. This page was last updated on December 6, 2016.